Travelling with pets in your vehicle is sometimes a necessity. Whether it’s to the vet, the park or on a long haul journey, keeping them and you safe is of utmost importance. Failing to restrain animals properly is illegal and can cause an accident involving harm to your pet, yourself, your passengers, bystanders and your car. By taking these precautions you can help keep everyone safe. · Prior to travel - Just like a child, ensure your dog is fed and has been to the bathroom. Keeping them calm and making sure their immediate needs are met before you leave will allow them to settle easier in the car. 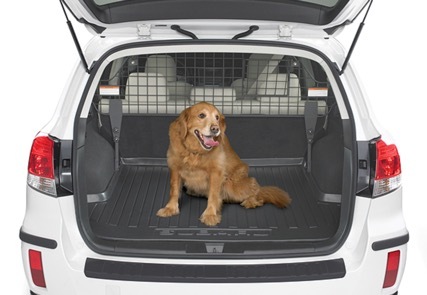 A little exercise beforehand is a good idea too, so that your dog is happy to have a rest once inside your car. 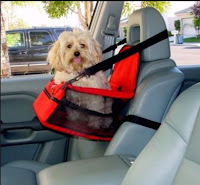 · Restraints - It is mandatory in all states of Australia to have your dog properly restrained so they cannot interfere with your concentration while driving. No matter how small, a dog sitting on your lap is a big no-no! Dog restraints can be purchased from pet stores and tethered to the back seat belts or onto the back of your utility tray. If your dog is small enough for a pet carrier, it must be kept secure behind a cargo barrier in the rear of your wagon or with a seatbelt around it. Pet carriers can become lethal weapons in an accident if left unrestrained. · Water and food - Be sure to take a small container of water and some snacks for your dog, particularly on a long trip. Becoming dehydrated or hungry may upset your dog and see them become anxious during travel. Taking a rest break for some exercise and food is also a good idea on an extended journey, helping your dog to resettle and remain calm throughout. · Apply these tips to cats and other small animals when travelling too. The main thing to remember about these types of animals is they cannot sit in a restraint as dogs can. Instead, they must be transported in an animal carrier, properly secured behind the cargo barrier or with a seatbelt. Cats and smaller animals love to hide, so if they are let out of the carrier they can easily upset your concentration and get into unsafe places such as behind the steering wheel or under the pedals. Very dangerous! Better for the larger dogs!